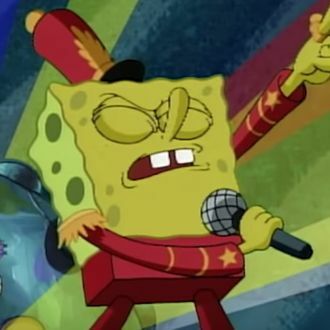 A formative moment for everybody’s cartoon upbringing was likely that episode of SpongeBob SquarePants when SpongeBob, Patrick, and their (literal) merry band of misfits rise up in their dome to perform at the annual Bubble Bowl, giving one hell of an arena rock performance to the rapturous crowd. It was kind of like Boston, Guns N’ Roses, and Journey had an under-the-sea sonic explosion with power ballad “Sweet Victory,” and because the show’s creator, Stephen Hillenburg, passed away a few months ago, petition campaigns have been urging the Super Bowl halftime show (or rather, the NFL) to incorporate the song into the performance in whatever way possible. Well, this is by no means an official confirmation, but let’s just say Hillenburg would be pretty happy with what we’ve discovered. That’s because two television journalists, who’ve been covering the Super Bowl over the past few days in the lead-up to the game, captured images and video of SpongeBob while Maroon 5 practiced in the stadium. Maroon 5 isn’t actually heard singing “Sweet Victory,” but those cartoon band ensembles are unmistakable. That, and the stadium has tweeted out a SpongeBob GIF to fuel the tabloid fodder even more. Do the right thing, NFL. We really don’t need a Songs About Jane medley.